When I was growing up, elves were benevolent creatures. They baked delicious cookies in a hollow tree. They made shoes for the shoemaker when he was asleep, and toys at the North Pole for good girls and boys. Sometimes if you were really good, they would even clean your house. My brother and I crossed our fingers hoping this time the elves had come. They never did. And that’s probably a good thing. The thought of elves creeping around our house would have been a little terrifying. Not the chore-doing kind. Not the cookie-baking kind. Not the toy or shoe-making kind. Nope, this elf is the spying kind, who hides in odd places and runs reconnaissance on innocent children while they sleep. I only recently became aware of this new development. After doing a little research, what I found looked surprisingly familiar. But apparently a few years ago an enterprising mother/daughter team took the initiative to turn these little Germanic pixies into NSA agents for Santa. He wouldn't want to bother Santa, who is terribly busy this time of year. And he certainly wouldn't want to make a nightly commute to the frigid North Pole when he could stay toasty and warm inside. So he would take things into his own tiny mittens and whisper well-intentioned warnings to the kiddies. 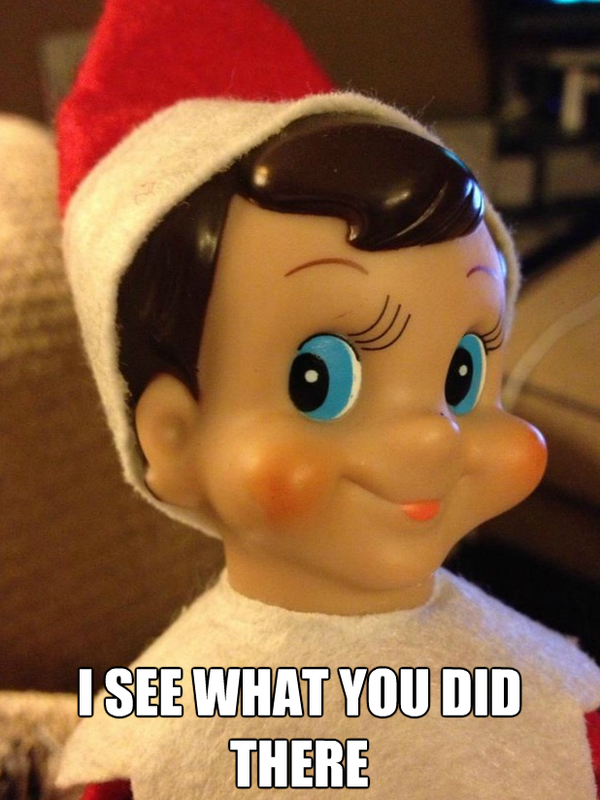 When my elf became bored, he would quote Joan Crawford movies and 70's sitcoms. My elf wouldn’t last long. Sometime during Advent he’d find himself used as kindling, the happy family gathered together around the fireplace watching his paint and felt go up in festive pink and green flames. Whoever stated that “sarcasm is imaginatively bankrupt” obviously never read the New Yorker. Or followed David Sedaris’s book sales.